Among the many taxa described in this technical work are forty-seven new cavericoles, of which twenty-nine are troglobites. These new species come from Mexico, Belize, Guatemala, Jamaica, and Texas. 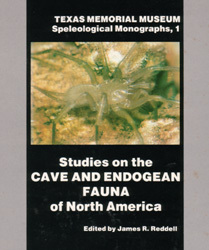 There is also a review of the cave Collembola of Mexico. A new troglobitic crab (Crustacea: Decapoda: Pseudothelphusidae) from Belize, by H. H. Hobbs, Jr.